Updating the ornaments, I got a a bit more done during the week. Panthers are doing really well, and I stayed up way too late last week watching that game. I did finish the sewing machine stitching. The little scissors gave me a fit, the metallic threads kept making knot and loops. But I got this far. 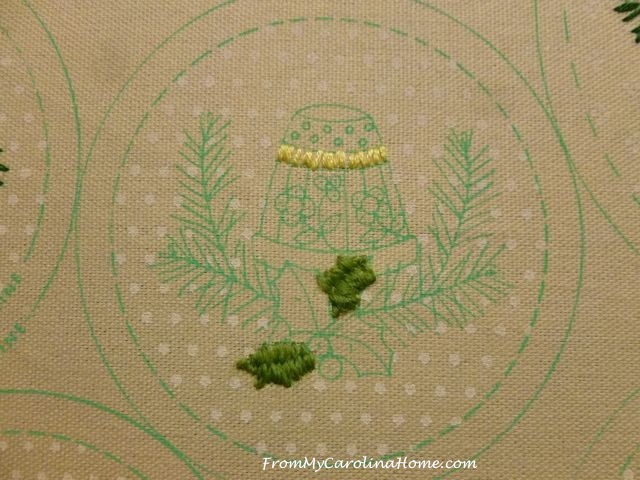 Lastly, I started a little bit of the thimble, using up the yellow and green left in the needle. That’s it for stitching this week. I hope to get a bit further today. I have a total of four ornaments completely stitched, and five in progress. Once all the stitching is done, then I will have to sew and stuff the ornaments. There is fog in the valley this morning, with rain lightly falling and the view is stunning! The far ridge is completely obscured by the clouds moving in, and the layers are easier to see with fog between. I have more pics to show you from our drive yesterday, and I’ll get those up next week. 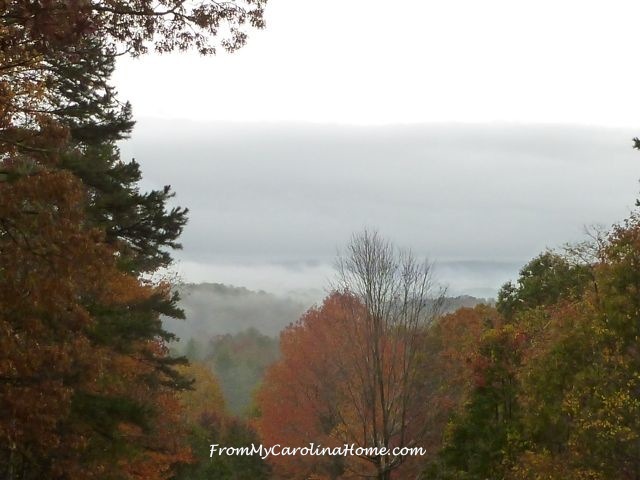 Peak color has come to our elevation, it is just an explosion of color right now, even in the rain. There is one more football game than usual today (five instead of four! ), and there is a Formula 1 auto race to fit in today too. It is November, which means the Halloween decorations get packed up today, and my turkeys come out to play while the games are on. Panthers play on Monday night. Go Panthers!! Your ornaments are coming along beautifully! I think your ornaments are so cute! I truly am glad that you are sharing them. I was able to get a charity quilt, quilted and the binding sewn on. 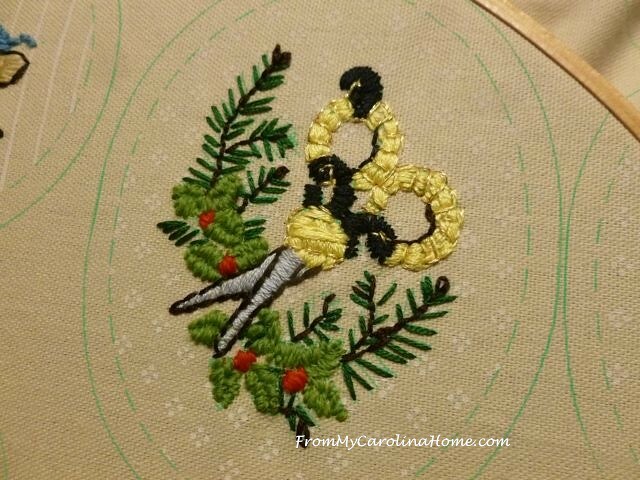 Plus, I was able to get a few more stitching done on my present embroidery project. One of the ladies in our group does needle turn applique and I asked her opinion on doing hand stitching around a iron on stabilized applique piece. I was really worried that they would fray and not hold down well. She said that with the way my stitches are just enough tiny and held tight that they would work marvelously. So, I have got to get busy on all of these also. They are for a Double Wedding Ring quilt for my daughter’s Godmother’s granddaughter. Try saying that three times really fast. LOL. I also got the Scrap Dance up on the wall to be spray basted and pinned….but I got it on the wall!!! I hope that you enjoy all of your games today and setting out new decorations! Have a wonderful creative day! Thank you, Carole, for another glimpse of the beauty around you and the art you produce! I really am enjoying these ornaments over the past few weeks! And what a gorgeous view! What I really like about this series and the concept behind it is that if you do even a little bit of a project on a regular basis, progress is made. I’m enjoying how your ornaments are coming together. What cute little ornaments! Lots of stitching for sure! What a beautiful view even with the fog and clouds! Okay, I am steeling that thimble idea. Love them all, but really like the thimble. The ornaments are looking great. I love that sewing machine. Sometimes those metallic threads are very frustrating. I am enjoying the ornament updates. I’m not a big fan of metallic threads either! Your ornaments are looking great! 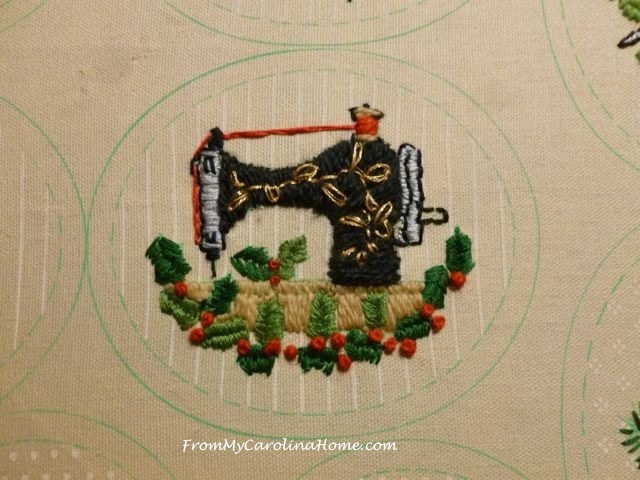 love the sewing machine! Your ornaments will be so lovely when they hang on your tree. And I must back my Patriots as I’m in New England. The ornaments are so cute. look at that sewing machine! Your sewing machine is just so sweet! You really captured the quirky nostalgia they have. The landscape looks so inspiring, I love misty, foggy mornings at this time of year. What a lovely project. Spectacular Autumn colours! Sweet little ironies…and very nicely done. Congratulations on the Panther’s win last night. Great game!!! Carole, these pieces are just beautiful.. you in inspire me to do more. I’ve got a question.. I’m about to start a crib quilt of enbroidered blocks. I eanred to use the DMC #5 perle cotton.. do you use it? Should I wind it in a a ball orcut to lengths or wind it on the little cards..